It looked like the rehearsal of a medieval battle scene. People fighting with swords and spears, wearing track pants and t-shirts, were thrown into relief against a darkening sky in New Farm park. The mystery was solved when someone handed me a green leaflet that said: Jugger. Jugger is a game based on the 1989 film Blood of Heroes, re-titled Salute of the Jugger. Starring Rutger Hauer and Joan Chen, the film is set in a harsh post-apocalyptic world where teams of roving bands – juggers – battle for a dog’s skull trophy and aspire to join an elite league in one of seven underground cities. Writer/director David Webb Peoples is said to have invented the game. Inspired by the film, groups of Jugger teams sprang up in Germany and in America, followed closely by Australia – on Queensland’s Gold Coast. Ireland, Denmark, Costa Rica and Spain later. Germany dominates, with about 35 teams and a few hundred players. In Brisbane there are around 30 regular players and up to 50 more casuals. Adam Horsten, 35, has played Jugger for 11 years. He estimates the number of players at around 100 in Australia and about 1000 world-wide. He said many of the first Jugger players had a Larper (live action role players) background – “like Dungeons & Dragons, except you dress up”. Adam is president of the Australian Jugger League. His team, Skullduggery, is the longest-playing team in Brisbane. The name was chosen as “a salute to the memory” of Gavin Ellis, who introduced Jugger to Queensland. Gavin was in his early 20s when he died after battlling Cystic fibrosis. Following Gavin’s death in mid-2003, Adam and other friends kept the game alive, moving it to two locations in Brisbane, then settling on the more centrally situated New Farm a few years ago. 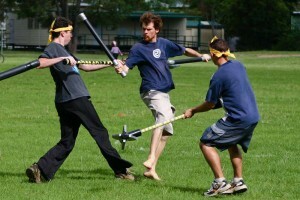 Jugger weapons and rules of play vary from country to country. The Australian version is similar to Germany’s. When the Australian team travelled to Germany to compete, the German team put them up and showed them around. Vice-president Simon (Fiend) Feeney has played Jugger almost every Sunday since 2004. “I used to have a Sunday routine before I started playing Jugger but I can’t for the life of me remember what that was,” 40-year-old Fiend said. Scientist Wendy Musgrove, 31, another long-time player, is club treasurer. Wendy calls the game “addictive”. New player Rachael Whitaker travels from Wynnum for the Sunday games. The 22-year-old QUT student said she was initially attracted by the idea of fighting with weapons. The game is fast and furious, with movement in all directions. Play is serious but the atmosphere is village-like. Men and women play side by side. Ages range from kids to late middle-age. Padded weapons are home made. Children and newbies are encouraged to play. And more experienced players love to offer advice. Information about juggers can be found at www.jugger.org.au. The object of the game is to get the dog’s skull to the opposite end of the field and to put it on a stake. If a Qwik is tagged, he/she she drops the dog’s skull, giving the other team’s Qwik a chance to grab it. Tagging – striking another player with your weapon. Rules apply about where and how a strike is made. Its great fun, everyone is welcome to come and play or just watch and cheer. its free and fun.